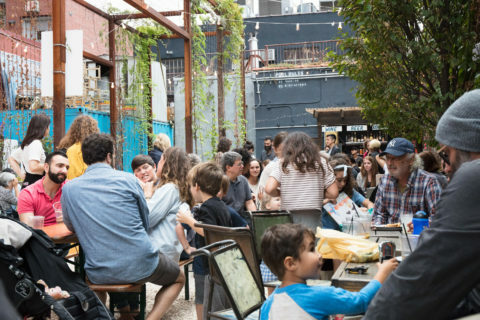 BBQ Benefit for Esperanza | Esperanza N.Y.
On Sunday, October 15th 2017, Esperanza gathered friends, supporters and BBQ lovers at Threes Brewing for an afternoon of food and fun. Preparations for “Whole Hog for a Cause” started on Saturday when our volunteer BBQ masters Peter Meehan and Jonathan Hooper and their trusted crew members Seth Prouty and Bob Schultz built a smoker on site; cooking began late that evening and continued through the night. On Sunday afternoon when guests began arriving, the tables were set for a feast. Delicious sides were provided by the Meat Hook who also donated the meat and beer brewed in Brooklyn was served by our generous hosts, Threes Brewing. Esperanza thanks all the volunteers and sponsors who made this event possible as well as the attendees, staff and board members who joined us. These efforts and contributions are greatly appreciated, especially as we head into the holiday season with our young people and families. Stay tuned for more ways to get involved!